Beautifully engraved Stock certificate from the Cartridge Television Company. This cancelled Stock was issued in 1972 for shares of common stock. This item is in excellent condition with normal cancellation markings. CTV was an early pioneer of Cartridge TV. 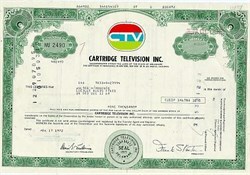 The highly desirable certificate has an ornate border around it with a vignette of the CTV Logo in the shape of a TV. This certificate will make a great addition to any collection.